How are we to make sense of the transformation in gay representation-- from virtual invisibility before 1970 to the "gay chic" of today? Off the Straight & Narrow is the first in-depth documentary to cast a critical eye over the growth of gay images on TV. Leading media scholars provide the historical and cultural context for exploring the social implications of these new representations. Featuring interviews with: Edward Alwood, Richard Dyer, John Erni, Larry Gross, Lisa Henderson, Marguerite Moritz, Charles Nero, and Sasha Torres. Katherine Sender is Assistant Professor at the University of Michigan. She is author of Business, not Politics: The Making of the Gay Market, which was nominated for the 2006 International Communication Association Best Book Award. She has also published numerous articles, including the forthcoming Dualcasting: Bravo's Gay Programming and the Quest for Women Audiences and Professional Homosexuals: The Politics of Sexual Identification in Gay and Lesbian Media and Marketing. She was a 2006 recipient of the Trustees' Council of Penn Women's Summer Research Award. Katherine is also the producer of MEF films Further Off the Straight & Narrow: New Gay Visibility on Television, 1998-2006 (2006) and Recovering Bodies: Overcoming Eating Disorders (1997). "An unusually accessible yet sophisticated educational resource." 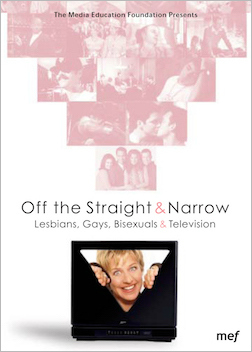 "Off the Straight and Narrow explores the history of television's treatment of lesbians, bisexuals, and gays, from the infamous 1960 CBS special where gay men were interviewed hidden behind a potted plant, through the disastrous early AIDS coverage, up to Ellen's famous coming out on prime time TV."